If you live around Section 17 in Petaling Jaya, you would have heard about this place that serves nasi lemak and western grill food during night time. I first came across it long long ago when I was taken to this place by some friends for a New Year's party as they knew the owner's son, Eric who now runs the place. Previously their outlet used to face the field but now they have shifted to a more prominent spot in front which attracts a lot more business. It's at the same row as Food Foundry which is at the other corner facing the trees. 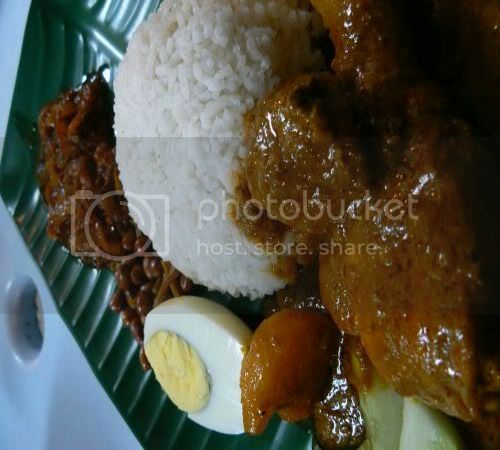 I decided to have the famous Nasi Lemak - you can order a variety of Mutton Curry, Beef Rendang and Chicken Curry. I chose to have the chicken curry with my nasi lemak (RM6) that came with hard boiled egg, cucumbers, peanuts and sambal. The sambal is just nice for me as it's not too spicy. Although the chicken curry was pretty good, I would have preferred it with more lemongrass taste. My dinner companion decided to try their Red Wine Lamb Special (RM21.90) which was enormous as it had five pieces of lamb shoulder. 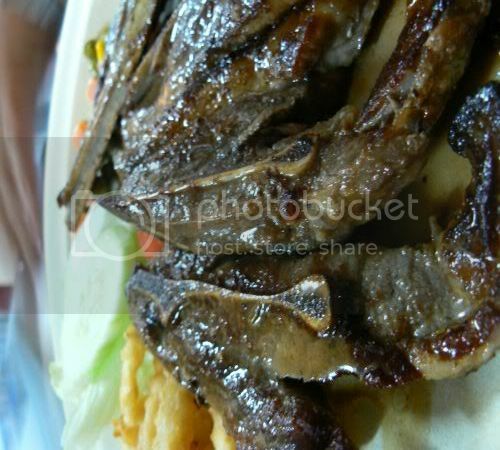 This came with french fries and mixed vegetables that were drowned by the huge lamb pieces. What's great about their lamb is they have trimmed down the lamb shoulder pieces from all the fat you usually get and it's nice and juicy on it's own that you don't really need to add the mint sauce it's served with. This place was quite packed on Friday night but like all ugly Malaysians, parking around the place was haphazard with some people double parking. I'm sure the residents in the flats above must curse this place every night as their patrons' parking habits made it so difficult for them to get to their units. Do give this place a try. Heard that it's also famous for it's red wine pork ribs which my friend claims is the best. i have seen flat owners taking photos of the inconsiderate drivers parking all over the place and also swearing at customers/shop owner... so please be considerate when parking there! i've been a fan of their since 1992 when they were still selling at a makeshift stall by the roadside. those days their nasi lemak had more choices for lauk. lanatir - It was really bad for us as a customer already as we had idiots double parking at the back that made it so difficult to reverse out. Worst thing was the car owner (who sat at the tables outside) saw the whole incident and didn't bother to even help remove his car. ya really celaka when ppl want to park right up the door step and dun even bother to walk a bit more. lanatir - ugly Msians as usual. Worst thing will be if this continues, I wonder if the mgt of the apts will let this place continue business as they have become a nuisance to the residents. lanatir - well, think it sounds like a possibility of discord between the residents and them since you mention them taking pixs. puspha - when are u back? Am sure you will be able to stock up lots and lots of nasi lemak in yr tummy.